The Husqvarna Snow Blower ST224 24-Inch 208cc Two Stage Electric Start Snow Blower is a 24 inch wide snowblower, excellent for standard consumer driveway clearing requirements. A 24 inch wide snow blower takes less space for storage which may be important for some consumers. There is the trade off between easy storage that does not take much space and clearing a large driveway quickly. Consumer reviews are generally very positive with a 73% positive rating. Some customers reported receiving the snow blower with some damages. Some units are sold and purchased as used units on Amazon. Buyers need to be careful when purchasing any used snow blowers. Service and warranty can be challenging. This item does not ship to Canada. This snow blower comes with an electric starter, remote direction control, heated handles and many more features. See more below. At the time of writing this review, there were 135 customer reviews with a 75% positive customer review rating of 4 or higher. Negative reviews included comments suggesting that it was cheaply made, noisy pulley and belt. there seemed to be some problems with used units that are being sold on Amazon. consumers should be careful buying used snow blowers. The remaining comments are very positive for this snow blower. 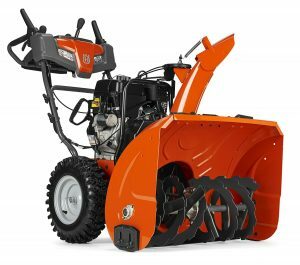 The Husqvarna ST230P – 30-Inch 291cc Two Stage Electric Start snow blower has lots of great features, however consumers are reporting that there is a problem with the belts shredding and the snow blower not living up to expectations. See customer review summary below. Description: The Husqvarna ST230P – 30-Inch 291cc Two Stage Electric Start snow blower comes with 30 inch clearing width, 12 inch clearing height capabilities. It also has steering control, and LED light and electric start. Heated handles also help in cold weather if you are out clearing snow for long periods. At the time of preparing this review there were 44 reviews with only 52% of the reviews rating a 4 or better out of 5. 32% of the reviews awarded a 1 rating for this Husqvarna ST230P – 30-Inch 291cc Two Stage Electric Start snow blower. There appears to be a big problem with the auger belt. It does not last and many customers had to replace it after only a few hours of use. Some returned the snow blower to the store where they made their purchase. Other consumers attempted to replace the belt, which can be done by anyone who is familiar with working around small engines. Belts should last years and not hours. This is a major issue for this model. One customer reported that the belt ran 20 minutes before shredding. A symptom of belt failure is that the auger tends to push the snow rather than grind it up and throw it out the chute. Basically the belt begins to slip, the auger slows down and the snow builds up in front of the machine as you move forward. Some consumers felt that the machine was cheaply made. The Husqvarna ST224 – 24-Inch 208cc Two Stage Electric Start Snowthrower has many great features which will satisfy most consumer needs for the average consumers driveway. There are 6 forward gears and one reverse gear. It clears a 24 inch wide path and an intake height of 23 inches. This snow blower is not CARB compliant. It comes with 15 inch wheels and two LED powered lights. The control for the chute is multi controlled – e.g. both the chute direction and the chute deflector can be controlled remotely on a manual basis. 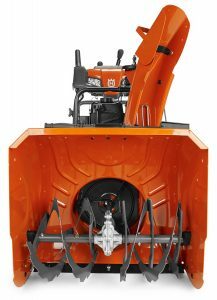 This snow blower can be started manually as well as using an electric starter by plugging in the chord and connecting it to the appropriate place on the engine. 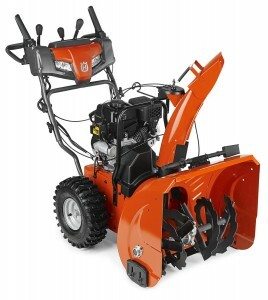 This snow thrower is more than suitable for most consumers. If you have a long wide driveway or are intending to use this machine commercially, you may want to opt for a larger machine. Description: This is a two stage, 6.7 hp engine with heated handles and one hand operation as you adjust the chute direction. It does not have steering control. The Husqvarna ST224 – 24-Inch 208cc Two Stage Electric Start Snowthrower weighs 240 pounds and uses regular gasoline in the 4 stroke engine. At the time of writing this review there were 60 customer reviews with 45 of them positive reviews. Customer service was an issue for several customers along with some broken parts on delivery. Most customers were satisfied to extremely satisfied.